Before he embarked on a week of transatlantic diplomacy, President Trump sat down with Deputy Attorney General Rod J. Rosenstein, who previewed for the boss an explosive development: The Justice Department would soon indict 12 Russian intelligence officers for hacking Democratic emails to interfere with the 2016 U.S. presidential election. [post_ads]For the first time, the United States would be charging Russian government agents with planning and executing a sustained cyberattack to disrupt America’s democratic process. Yet Trump gave no sign in his commentary in Europe this week that he appreciated the magnitude of what he had been told was coming. Instead, he repeated his frequent attacks on the integrity of the wide-ranging Russia probe led by special counsel Robert S. Mueller III — while offering kind words for Russian President Vladi­mir Putin, who he is slated to meet here in Helsinki on Monday. Trump said Putin should not be considered his enemy but rather his competitor — and after spending some time together here in this vibrant seaside Nordic capital, Trump said he hoped they might quickly become friends. 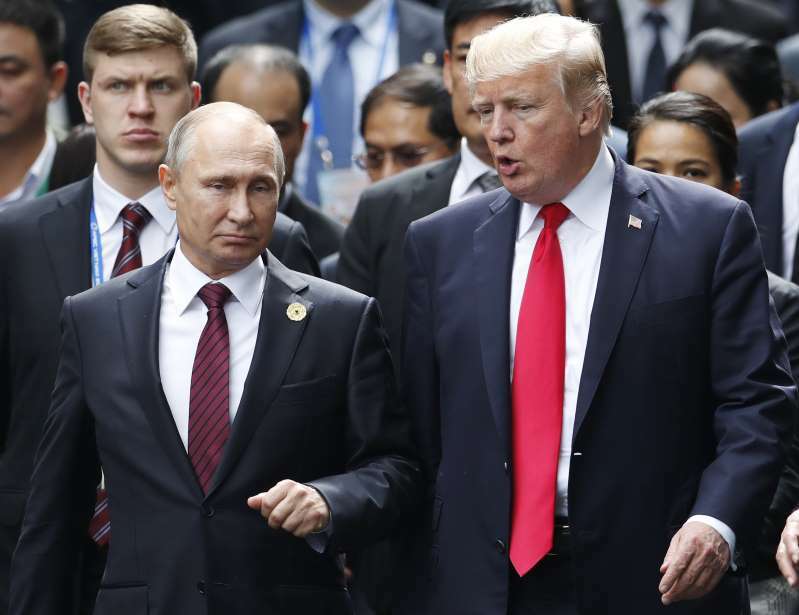 Trump pledged to ask Putin in their tete-a-tete whether Russia interfered in the election — “your favorite question about meddling,” he said mockingly to a Washington Post reporter. But he said he expected Putin, again, to deny it, and that they then would move on to other subjects. “There won’t be a Perry Mason moment here, I don’t think,” Trump joked, referring to a witness dramatically reversing his or her testimony to confess a crime. On Friday, just hours before Rosenstein announced the indictments from Justice Department headquarters in Washington, Trump stood on foreign soil — at a news conference with British Prime Minister Theresa May at her Chequers estate in the English countryside — and denounced the investigation that produced them. “I would call it the rigged witch hunt,” Trump said of the Mueller probe, which so far has yielded charges or guilty pleas against 32 Russians and Americans, including former Trump campaign chairman Paul Manafort, who is in jail. In the hours after the Justice Department’s indictments were filed, lawmakers from both parties urgently called on Trump to confront Putin, force Russia to change course and guard against another intrusion in future elections. Some Democrats, including Senate Minority Leader Charles E. Schumer (N.Y.), said Trump should immediately cancel his Helsinki summit with Putin. “Glad-handing with Vladimir Putin on the heels of these indictments would be an insult to our democracy,” Schumer said in a statement. But as night fell Friday in the United Kingdom, where Trump is staying through the weekend, neither the president nor his White House spokesmen condemned Russia for the allegations detailed in the indictments. The meeting in Helsinki was still on. There was no indication late Friday that Trump was preparing to say anything else in their meeting to hold Putin accountable. “Cyberspace is the new front of warfare and our country was attacked, but instead of treating this like the real Pearl Harbor moment that it is, the president just wants to have business as usual,” Vance said. Announcing the indictments, Rosenstein bemoaned the extent to which the Russia probe has divided Americans along partisan lines. U.S. intelligence agencies concluded in October 2016 that Russia orchestrated the hacking of Democratic emails — as well as other tactics, including a campaign to infiltrate social media with fake news — and that the Russian operation was designed explicitly to help Trump defeat Democratic nominee Hillary Clinton. For many months, Trump refused to believe that Russia was behind the hacked emails. “The new joke in town is that Russia leaked the disastrous DNC e-mails, which should never have been written (stupid), because Putin likes me,” Trump tweeted in July 2016. [post_ads]It was only after he won the election, at a news conference shortly before his inauguration, that Trump stated publicly that Russia committed the hacking, though he has waffled in his public statements since then. Trump’s advisers have said he resists acknowledging the election interference because he does not want to attribute his election win to any force other than his skills as a candidate. Trump and his legal team, led by former New York mayor Rudolph W. Giuliani, have aggressively attacked the Mueller investigation in recent months, part of a more combative approach designed in part to turn Trump’s loyal supporters against it and sow doubt in its eventual findings. Trump regularly tweets the phrase “witch hunt” — sometimes spelled in all-capital letters — to vent about the Mueller operation or to stir up people against it. But Democrats say he is not taking the investigation seriously enough.